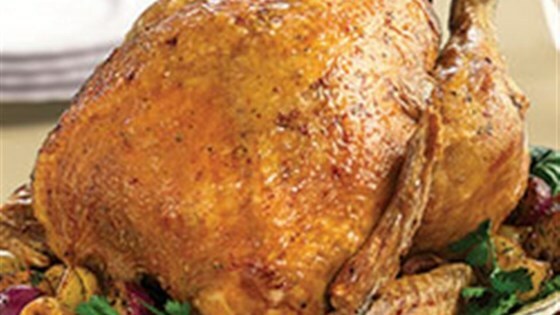 "Seasoned with spicy Cajun seasoning and cayenne pepper, this deep-fried turkey takes the holiday dinner's starring role to new heights." Pat turkey dry with paper towels; coat completely with no-stick cooking spray. Combine rub ingredients in small bowl; rub over turkey. Combine spice injection mixture ingredients in small saucepan. Cook and stir over medium heat until butter is melted. Let cool to barely warm. Inject the mixture with spice injector into several spots on both sides of the turkey breast and thighs, making sure not to inject too much into any one spot. Cover and chill overnight. Fry according to fryer manufacturer's directions using peanut oil. Reference package for additional information. ?? Which ingredients are for the rub and which for the injection? ?